Roleplaying can be a great source for stories. But whether your stories come from roleplaying or whether you wrote them separate of anything else, this is the forum to post your stories. These stories can be funny, dramatic, epic in scale, of very small scope, or really anything you can think of. Note that this forum is for posting stories only. Discussions on stories and even just simple compliments should be posted in the Out Of Character forum or by sending a private message to the author. I knew from the start wotc wouldn't give us one, so they could continue using the drow. But I was curious on what a happy ending to the Lady Penitent trilogy would look like. Could it? Halisstra wavered. Would Eilistraee truly take her back, after all she had done? Halisstra could feel the power of the goddess who stood before her. It radiated from Eilistraee, filling the chamber. Cleansing it. Turning a place of darkness and death into a place of moonlight and song. The tiny spark that had been nickering, flear extinguished, deep inside Halisstra, longed to be fanned back to life. When that happened, her torment could end. She would be forgiven. Redeemed. Eilistraee held out her hand. "Come," she sang. "Take my hand. Accept my mercy. Rejoin the dance." Halisstra leaned close. She lowered the Crescent Blade. Extended her free hand . . . The whisper was thin, metallic. It came to Halisstra's ears like the hum of a tuning fork, as the sword in her hand vibrated. Eilistraee looked through Qilues eyes atHallistra and for a second the mask totally vanished, her brothers influence so deeply submergedin this moment, she said. "your mind and soul I rectify now, your body must remain as it is until Lolth is dead." Hallistra bristled a bit but after a second felt it might be harder to accept, if the forgiveness was completely instant and bowed her head. "I understand my lady" bowing her head. Eilistraee paused "but the sword… itself I sense something amiss "
Hallistra Sighed reutnrning to the abyss she was ready for anything now… she would enjoy killing lolth more then anything… she truly saw her mistake now in having doubted Eilistraee..
"so you have the accursed sword?" Lolth bellowed"
Perhaps I can find some use for it.. give it to me. "Its over its finally over"
"First thin I plan to do is apologize to my brother and hug him once more. Maybe together we can help our people build a new path together. Lolth looked wildly around. Eilistraee was gone! She laughed a shrill, giddy peal of delight. "You concede?" she cried. "At last, the drow are . .. ?" Just a moment. Something was wrong. Eilistraee's realm should have disappeared with her. Yet it remained, just on the other side of the board. Forest, moonstone fruits, stars . .. Everything was there, except for the moon. It had vanished from the sky, as if. .. Yes, that was it. The moon wasn't gone; it was just eclipsed. Still up in that sky, somewhere. Just as Eilistraee herself was still here ... somewhere. Lolth's eye fell on the Warrior piece. A pass of her hand over it, palm down, confirmed her suspicions. She could feel the loathsome moonlight hidden within. The Warrior still looked as it had, but that was just a disguise. The piece was no longer hers. Vhaeraun had, indeed, taught his sister well. She could see now what Eilistraee's plan had been. The demonic Warrior piece stood on a line that led directly back to Lolth's Mother piece; one move would take the Mother out. But Lolth's bestial Priestess would soon put a halt to that. Lolth snapped her finger back in pain… The piece was no longer hers either. And saw she had only one move left… then she would be unmade. 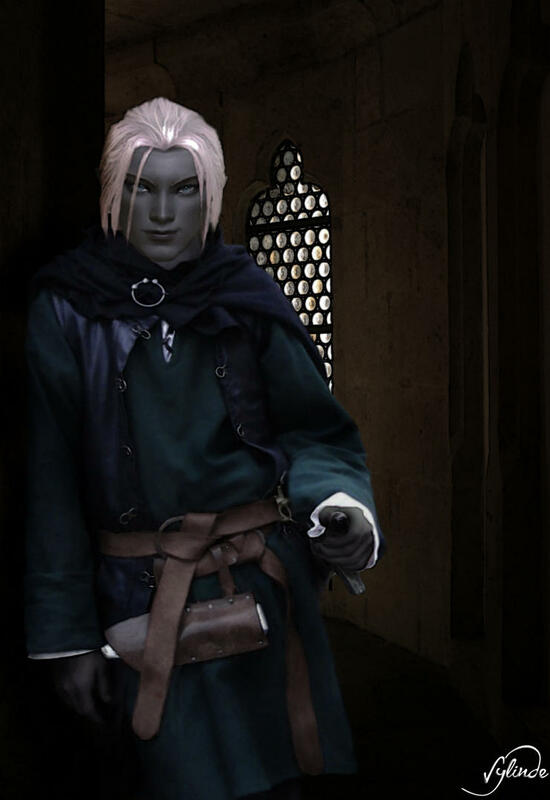 And the DROW will belong again to the likes of Eilistraee, and through her Correlon. A warrior, she moved to wipe out a group of traveling moonshard. Hopefully slaughtering dozens, if not hundreds of eilistraees worshipers before being taken down. "Mother, must your last act, be one of spite?" Eilistraee said shaking her head sadly. She said moving the piece smoothly, it respondingintstant now to eilistraees command and moved it to take Lolths piece with a single graceful move. Lolth looked at her daughter with pure, andunmitigated hatred. "You will lead the drow back into enslavement under correlon, if I am too weak to beat you then death is what I deserve… I will not beg for my life"
Eilistraee nodded and said "game"
Eilistraee knew better then to even try consuming lolths power, she had already been changed, perhaps forever, by absorbing Vhaurens power… she dared not even touch lolths. Lolth Sccreamed through it all her form breaking apart, as Eilistraee broke the Mother piece. As her mother died Eilistraee Wept… their could be no redemption for her now. "how long will it take, to plant tree's here, to place stars in the sky?" Eilistree sighed, she had a promise to keep and touched the demonic priestess piece. Within Seconds it was demonic no more… restored to the beauty it had known once before. Eilistraee sighed, the priested might never have her trust again, after her actions but she had her pity, and if she kept her oath, would be welcome in svartalfheim when she died. In fact she'd probably reunited with him in a few minutes. How many happy reunions would their be soon. Their would be no "reunion" for her and her brother… even if he should ever be resurrected he would simply see her as a new lloth. First correlon, then Lolth , now, if he ever returned her. Eilistraee then saw all of lolths pieces belonged to her. Some of course, had to be crushed. For the good of the Tel'quessir. The yochlol, she one and all destroyed ordering the dark song knights, and her own celestial servants, to sweep through the demon web pits, just to make sure none were left. She then turned her attention to the matron mothers. No not them… the snakeheaded whips. She could feel the confusion terror, fear and horror of all the Lolthites, but then sent a message to one hidden moondancer after another, that thetime to lead the people back to their destiny was at hand. Eilistraee looked at the realm.. The dice floated up into the air and became a twinkling of light. Now that this was done she should rejoin the seldarine formally. But before that … their was something she had to do. She sang, slowly calling on the attention of Ao. "Lord Ao, I ask for the resurrection of my dead brother"
"his worshipers need someone to follow… and I do not like how his portfolio has changed me… I have no other way to be rid of thismask"
"that is truly what you want, to sacrifice power to be rid of that mask"
"then be it so, be you the eilistraee you were beforehand… vhauren will return as a demigod little threat to you for many ages. She nodded and already she knew another game may well be played on thisboard,and she knew she couldn't get too lax, after all she won and she'd been at a disadvantage. "Father she called out" smiling feeling glad she was rid of the mask her silver eyes aglow, herself once more much like an innocent. "I could feel his power corrupting me father… I couldn't bear it… I felt some of my priestesses concerns on the issue. "Ao could have simply stripped you of the power, it would have been much simpler. "Besides, as the new Head of the drow pantheon, I'll need subordinates" correlon paused "you don't mean to. "Father of course I'll give you fealty.. but I still think I'll need servitor deitys at my age and rank. "nor do I ask it, I do think he'll start to find he can get moreworship by working with me then against me." "be it so, I accept your service, you will be tied to me, to Arvandor, and to the peopleshe smiled and for the first time in years left the board unattended for their was no war over the souls of the People… for now. Now THIS is an ending I oculd like! Hmmm, no more Lolth? Interesting. but how long would it remain so? That would make an interesting story, too. By the Dark Maiden''s grace do we meet. May she guide and protect us. know its 5 years old but something Ive thought of lately? think that I was right about lloth showing a moment of grim integrity, rather then becoming Eilistraees, closely supervised, and distrusted UNDERLING. [quote="Kirintha the Fair":3nh4r04m]know its 5 years old but something Ive thought of lately? What do you mean about Lolth become Eilistraee's underling, or showing any integrity? she states outright "I will not beg for my life" and "You will lead the drow into enslavement under Correlon"
Eilistraee probaly would have accepted Lloths Capitulation, but Lloth refuses. so you think lloth would have begger for her life? Idk. I don't think that she would have begged, but perhaps she would have tried to pull off some kind of sneaky trick, accepting to serve Eilistraee, then planning to betray her at some point. My point was more that she should know better than pretend that Eilistraee would lead the drow under Corellon, because she would not, until Corellon learned to accept the drow *as drow* (also given that he and the Seldarine played a *huge* part in the current situation of the drow. Those gods pushed the drow into Lolth's arms). The uncursing really had nothing to do with her and her goal. it may have been pretty Frickin difficult given the kind of geas she'd labor under.